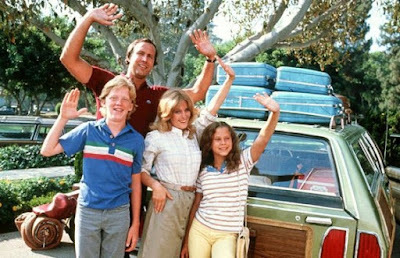 The planned sequel/reboot of the Vacation franchise by New Line Cinema has found it's team in John Francis Daley and Jonathan Goldstein. It appears that Jonathan Liebesman (The Texas Chainsaw Massacre: The Beginning) will be directing the Teenage Mutant Ninja Turtles reboot for Platinum Dunes. I expect this to be very Transformers-esque -- and that's not a good thing. I want more than just a flashy fireworks display for my beloved Turtles. Dan Aykroyd is coming to terms with the possibility of recasting Bill Murray in Ghostbusters 3 if Murray can't come to an agreement on the film. The absurdly charming one-time Ghostbuster and Blues Brother Dan Aykroyd was in the Empire office today for a webchat, and as well as shaking the hand of everyone in the building (including a bewildered delivery man) and being an all-round hero, he also answered a few questions. As you might have guessed, a couple were about the much-talked-about Ghostbusters 3, and here are some interesting tidbits about just that. [Talking about the reclusive Rick Moranis] "If we can get the script to Ghostbusters 3 right, then it would definitely have Moranis as a major component. None of us would want to do the movie without having him as a participant." Even more intriguingly, Aykroyd hinted that Bill Murray may not return as Peter Venkman, and that the character could be played by a different actor, a la Jack Ryan. So it's pretty much official now: Michael Keaton wants very much to reprise his infamous Beetlejuice role. So much for those rumours placing Macaulay Culkin back in the McAllister household (in a sequel to the original “Home Alone” that would’ve had the filthy rich former child star play father to a mischievous youngster like the one he played in Chris Columbus’s original; still, never know, it could happen. Did anyone think a fourth “American Pie” would happen, with the original cast, after all those direct-to-video spin-off movies!?). The next “Home Alone” won’t be a big screen venture with any original players (and likely no Wet Bandit). Looks as if plans for a sequel to The Karate Kid remake are under full-swing now -- seeing as a writer has been tapped to pen the script. Welcome aboard, Zak Penn. The new trailer for Sony's The Amazing Spider-Man has been released. And, wow, am I totally blown away. It's looking much better than I anticipated. Can't wait. The hunt has ended for the search for a new screenwriter for MGM's RoboCop redux. The CAA-repped Schenk had been working with Padilha, who co-wrote and directed Elite Squad: The Enemy Within, on the action thriller Tri-Border. The writer also has the original drama The Judge set up at Warner Bros. with Team Downey producing.